I am getting the blocks larger. I keep flipping from this block and that. 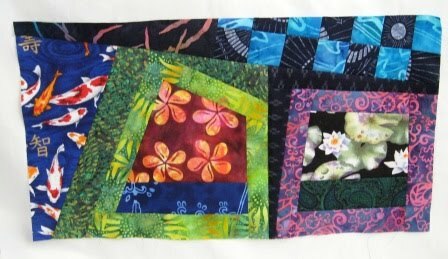 Then off to make more four patches. I have more bright colours added in. I just will have to make sure that they move around. I like the row of log cabin around some of the prints. I started to place two smaller blocks together. This way I will be able to make some kind of a row. I am started to worry about this part. I must have faith. Again I flip from this to that. I go make more four patches. I am sure they will come in handy for making a block longer or wider to fit with the next block. 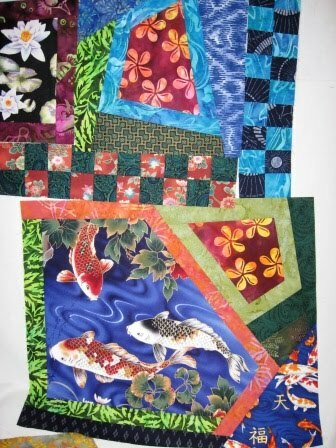 I think these block posts are keeping me working on this quilt. 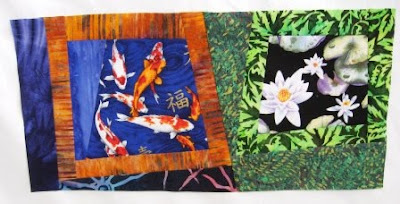 I have two other ideas for quilts I want to start. 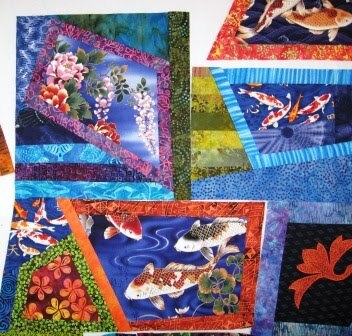 But I must keep my fish quilt fans going. I must finish the quilt top. I am worried I will hit the wall and stop. How to make rows? How to lay this out? This started as a Gloria Loughman class and she did give us notes for this part. I am experienced enough to get it done but sometimes when it gets tough, I quit, or put it way for a while. 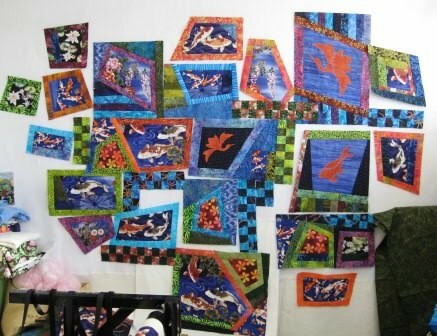 My mom was in the class and her quilt has been done for more than a year maybe two years ago. I should go find a photo of that to show you.